Hmm, two must try beers! I still have a fondness for IPAs with that citrusy hop aroma and flavor...I should find out what type of hops those are, come to think of it. I've looked at the Barton Baton in the store, but demurred. As previously mentioned, I like Dogfish, but they can be pretty over the top. I think I'll give it a try...I actually find myself in the mood for an IPA. Side note relating to Dogfish, I finally saw Beer Wars. I thought it was decent...could have been better, but informative, and I thoroughly enjoyed how much time the movie spent bashing Anheuser Busch. Now, I'm no expert, but I was considering an IPA for my next homebrew effort, and I was going to try for that citrusy hop flavor of the "plain" Stone IPA - And I think that uses Centennial hops (and I'm sure there are other hops as well), which is apparently part of the 3 C's (Cascade, Centennial, and Columbus). I wouldn't be surprised if one or all of these were in Hop Wallop, considering the amount of grapefruit flavor I was getting out of it. Or maybe not. The Victory guys are certainly in love with hops - much of what they make has a strong hoppy flavor, even when you wouldn't necessarily expect it (i.e. Storm King Stout). 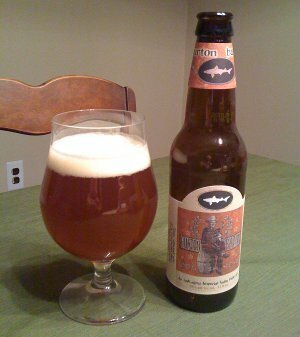 As for the Dogfish Head, it's great, but as I said, it's a lot like a punched up version of 90 minute. I loved my first one, then was slightly less impressed by a second the next night. The oak aging brings huge notes of vanilla and toffee, and the body is wonderful. 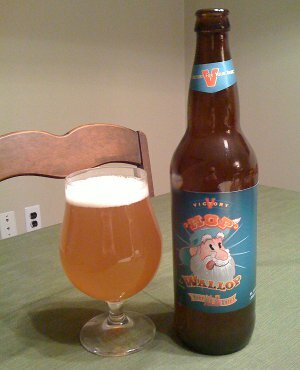 The booziness seemed balanced by the other big flavors, which is no small feat at 9%. The next night, I had a second, and this time, it seemed like the boozy flavor had moved to center stage, with the raisin barleywine flavor of the alcohol more powerful than the wood. I love a good barleywine, so this didn't make things unpleasant, but it was a surprise...the only difference that comes to mind is that I drank the first from a pint glass and the second straight from the bottle. Perhaps the bottle shape concentrated the alcohol? This page contains a single entry by Mark published on January 10, 2011 8:39 PM. Avec Les Bons Voeux de la Brasserie Dupont was the previous entry in this blog. La Trappe Quadrupel is the next entry in this blog.